Fellow couchsurfer Francesco tipped us off late last week to the opening of the Strozzina Centro di Cultura Contemporanea, the Center for Contemporary Culture at the Palazzo Strozzi. The Palazzo Strozzi dates to the late 1400’s, when it was built as the home of the Strozzi family, (doomed) arch-rivals of the Medici’s (lesson: don’t be arch-rivals of the Medici’s). 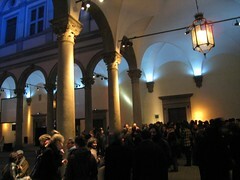 The courtyard was filled when we arrived with well-heeled Italians in high Italian fashion, young and hip as well as older and well-to-do. The swishing of fur was entirely drowned by a good techno-ambient DJ playing behind two large screens with trippy projections, and the Renaissance feel was cheerfully updated by the shifting violet, blue and yellow wash lights. Free champagne flowed along with a tasty, dry cheddar, olives, and tangelos. Good fun. to investigate the topic of emotions, proposing a reinterpretation of the correlation between the contemporary artist, the work of art and the user, in the light of the latest discoveries in the neurological sciences about the human brain and its effects on the emotions. Remember how you feel right now. This exhibit may change how you think about emotion forever. I dunno, call me an dullard, but after witnessing a concrete pile spraypainted a rainbow of colors and a CGI video of killer whales, I found myself regarding emotion in much the same way I had. There were two exceptions. Bill Viola had a moving high-definition, hyper-slow motion video of a line of people in grief, apparently viewing a casket (entitled “Observance”). The glacial unfolding of their reactions seemed to resonate with my own muscle memory of pain, creating a disquieting empathy. The other interesting piece was Christian Nold’s “Emotional Mapping Greenwich Village”. Nold wired up a perspiration sensor to a GPS and had over 1,000 people wear it over a period of years as they walked Greenwich Village, NYC. The result was an “emotional map” of the area, a visualization of how different areas made people feel. The concept, I thought, was brilliant and I tip my hat grandly to him for pulling it off. That said, the actual visualizations, lacked aesthetic quality. They seemed like the kind of maps that a computer geek would come up with, the result more of mathematics and limited tools then something worthy of an artistic study of affect. Still, beat the pants off the room filled with emotional words hand-scrawled on a wall. I'm coming back from a week in Tampa today. +1 on interesting, borderline wacky weather times.